Garden House Hostel is located on a charming pedestrian street in Old Town, just down from the stunning Capela das Almas, a chapel covered in hand-painted blue tiles. Hostelworld guests say they appreciate that this 'open and airy' hostel has a large outdoor terrace, friendly staff who provide a personal service and a lounge area featuring TV, movies and a guitar. We like their popular pub crawl, a great opportunity to discover the city and meet fellow travellers. 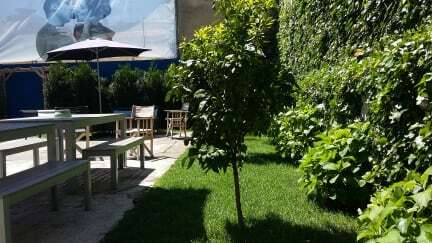 It is perfectly clean and it has everything you need- beautiful garden to chill, really good equiped kitchen to prepare yourself a dinner and tasty breakfast included in the prize of stay! Location is in the city centre of Porto so you need around 10 minutes to see all the main attractions. Staff is always trying to help you and they will make your stay in the hostel even better. Only 'problem' is that you could end up spending more time in the hostel than exploring beautiful Porto! Quedarme en este albergue fue el inicio perfecto para empezar el camino de Santiago! I LOVED this hostel. It’s in a great location, close to metro and supermarket and walking distance from the main sights you’d want to see. It’s a lovely environment and the room was amazing and spacious. Big locker that fitted my big pack and day pack. Card key to get into the room. Good breakfast and relaxing lounge area. Super friendly staff. Would happily stay again and would recommend to friends. Fabio is an absolute gem and garden house hostel is so lucky to have him!! His friendly, professional, knowledgeable and organized:)) My favorite receptionist so far ❣️ * trust me I’ve met a lot of them. Really happy with this hostel. It was easy to get to from the airport, just one train and a short walk. It was tidy and clean which is always a plus and the beds were comfortable. The garden in the back was perfect for relaxing in and the breakfast was simple but really nice. Special thanks to André for making us feel welcome and telling us about Porto! A bit loud but nothing ear plugs couldn’t fix. Best staff!!!! I stayed at the Garden House Hostel for three nights. The first two nights were excellent. The last night was not great: there was a party in the house that went on late (midnight or so), it was very loud, and new room mates came into the sleeping room very late and continued their conversations loudly. Not a great night for sleep. My friends and I enjoyed our stay here very much and wish we could've stayed longer! The staff here were so friendly and welcoming. My only complaint about the stay was that your could hear everything from the halls and such, but I think that's going to be like anywhere so I just suggest bringing earplugs! The bathrooms were kept very clean, as well as the rooms. It was the perfect place for us, and I would definitely stay here again and recommend it to anyone! Stayed here for 3 nights on my trip to Porto. From what I remembered, the rooms and the staff were overall very nice. Not as many events as other hostels I'm guessing, but I didn't participate in any of them either way. Prime location to stay in Porto though, far enough from the city centre that it's generally quite quiet, but still close enough that everything is very close by, especially when the market reopens.